The winding river Dordogne appears as though a string of pearls has been slung down onto a map of south-west France. From Bordeaux in the west to the newly opened Lascaux cave paintings in the east, the river and its tributaries have irrigated the growth of civilisation since the dawn of time. One small tower along its course is, perhaps, at the origin of its most important influence. More certain is its relevance to the way people should think about the world in 2017. The Tour de Montaigne is situated not far from Saint-Émilion, the picturesque citadel that has come to epitomise the charm of the region, with its rolling contours of vineyards and villages. Travelling east by car alongside the river Dordogne, through Castillon-la-Bataille, one finds a small signpost pointing left to the Tour de Montaigne and the village of Saint-Michel-de-Montaigne. The tower and village are found by following a small rural road for a further four kilometres. 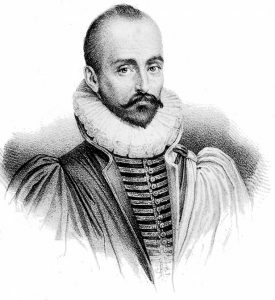 In the tower, Michel de Montaigne (see below), a 16th century nobleman from the region of Guyenne that was to become Aquitaine, tried on 107 occasions to write about the things that mattered most to him. He was forever sceptical about about their relevance. “What do I know?” was his usual form of self-reproach. Nevertheless, his Essais are recognised as one of the greatest achievements of the French Renaissance and have inspired many who followed, from Francis Bacon and Descartes to Isaac Asimov and possibly Shakespeare too. The tower in which Montaigne devoted himself to his long series of essays is spectacular for its simplicity and intimacy. Rather like the essays he penned, the place gives the impression that Montaigne could still be pacing the tiled floor of his circular office and scribbling the meandering text describing his cogitations. It is as if 450 years had disappeared with the click of a finger. 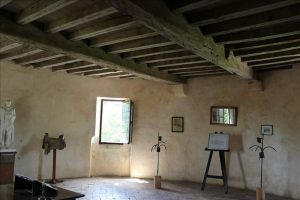 As a refuge for his work the tower could not be large, but the three levels comprise a chapel, a bedroom and the circular library in which Montaigne worked. He climbed the same narrow staircase, inscribed the wooden beams and looked at the same frescos adorning the walls of a tiny room in which he could keep warm in winter – fires being banned in proximity to his valued books. Montaigne was small in stature, and so are the doorways. Taller visitors will need to stoop to avoid colliding with the hard stone lintels. The tower itself is on the corner of a large complex of buildings that includes the much more imposing chateau. 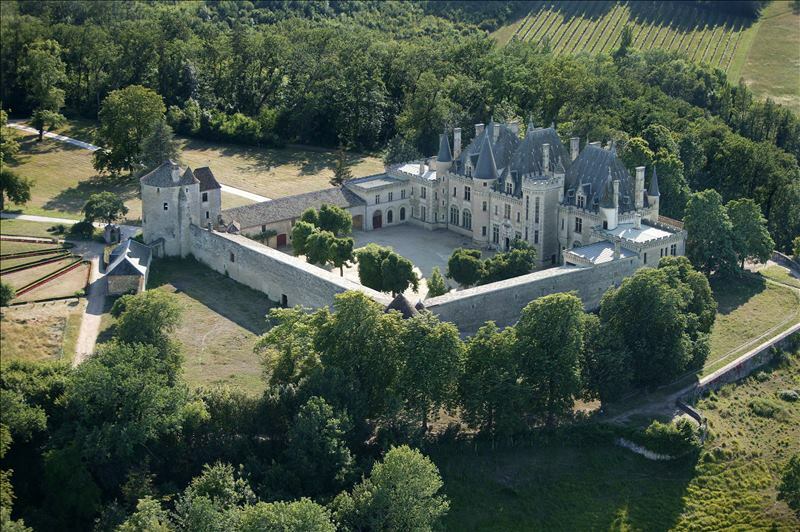 The original chateau was sold by Montaigne’s descendants in 1811 and it fell into disrepair and was damaged by fire. In 1860 the estate was bought by Pierre Magne, who later became finance minister to Napoléon III, and the existing chateau was built as an impressive demonstration of his power and wealth, but also in recognition of the works of Montaigne and a desire to preserve his heritage. The chateau and its estate have remained in the family ever since. It is situated amidst a vineyard that produces wine, just as it had in the days of Montaigne and his forefathers. 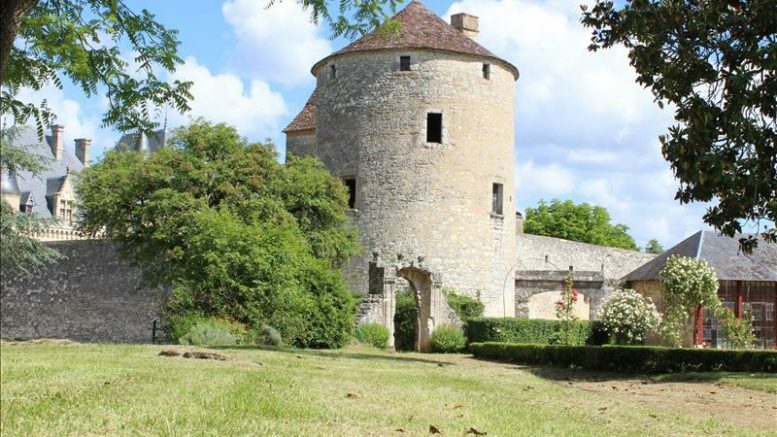 Money raised from the sales of that wine and the guided visits to the tower and chateau, is being used to develop the museum devoted to the life and works of Montaigne. Most recently, a stable in the courtyard has been converted into a small conference room where groups can meet. 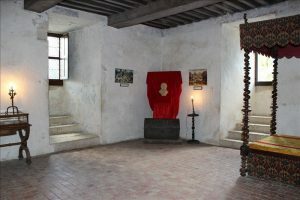 The centre is used to teach visiting school children about the essays of Montaigne – perhaps to make them feel more positive about their own. The Montaigne museum, tower and estate also have a close association with the University of Oxford. Each year students come to work on the estate and learn about the works of its most illustrious philosopher. The Tour de Montaigne received 15,000 visitors last year from around the world. Guided tours are in French and English. A visit to the tower and chateau is also an option for tourists who disembark in Bordeaux on cruise holidays. Otherwise a car is needed to reach its rural location. For visitors to the region, next year will see the launch of the new super-fast LDV train service linking Paris to Bordeaux in just over two hours. Libourne is a nearer station, about 30 minutes away by car, which can be reached by “standard” TGV from Paris in about 3 hours 20 minutes. 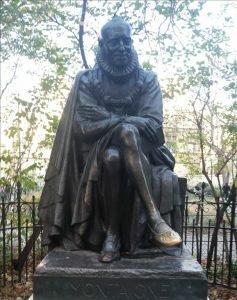 Michel de Montaigne lived through tumultuous decades in which France was progressing from a land of feudal territories towards a nation state. There was a continental uprising against an elite, who were then represented by the establishment that was the Catholic Church. Montaigne was born in 1533 – the same year as Elizabeth I – and 16 years after Martin Luther reportedly nailed to a Catholic door his objections to their practice of selling preferential access to heaven’s eternity. The Protestant uprising accompanied the winding down of the Italian Renaissance and the beginning of the Reformation across Europe. In France, its regions, villages and families were split along Catholic-Protestant lines, and a civil war ensued that lasted for most of Montaigne’s adult life. Montaigne was a child of the Renaissance and spoke only Latin until he was six. He was the eldest living child of a family that had grown rich over three generations through trade, particularly of wine, that passed through the local port of Bordeaux. Both he and his father had served as mayor of that city. But first and foremost Montaigne was an innovator. He wrote the first ever “essay” and through this he opened a window to look inside himself, at his own thoughts and into what really mattered to him. It was 1572 and Montaigne was 39-years-old. Over the previous few years he had witnessed the deaths of his best friend, his father whom he admired, and of his younger brother who died in a freak accident while playing tennis. Initially, essay writing had been a therapy to the “burn-out” Montaigne suffered following the tragedies. But the more he perfected his art, the more he came to understand that by looking inside himself, at his own idiosyncrasies and through this highly personal experiment, he was able to learn about the world in which he lived. Trips through Europe provided Montaigne with field experiments to build on the experiences expressed in his expanding series of essays. Eventually he would flee distraction of any kind, confining himself to his tower where he could dedicate his life to his thoughts and essay writing. They were given simple names: On the Vanity of Words, On Drunkenness and How We Cry and Laugh at the Same Thing. They could be short or long. Together the 107 essays form a body of work that has inspired 400 years of creative thinking right through to modern authors for whom it is natural to infuse their novels with insights into the mind of their characters in a very Montaignesque way. 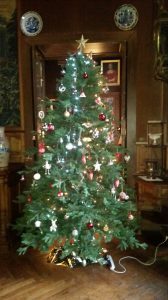 So, what can be learned from the way Montaigne guided himself and his family, and his community who depended on his estate for their livelihood, through the tribulations of the Reformation and the civil war that threatened their existence? The worst of these wars is that the cards are so mixed up, with your enemy indistinguishable from you by any clear indication of language or deportment, being brought up under the same laws, manners and climate, that it is not easy to avoid confusion and disorder. That made me fear that I myself would come upon our own troops in a place where I was not known, be obliged to state my name and wait for the worst. That did happen to me on another occasion: for, from just such a mishap, I lost men and horses. Among others, they killed one of my pages, pitifully: an Italian of good family whom I was carefully training; in him was extinguished a young life, beautiful and full of great promise. Visitors to the Tour are interested to learn how Montaigne responded to this challenge. He did so with tolerance and moderation, the guide tells them. An outward sign of intolerance Montaigne concluded would be to confront visitors to his estate with a closed door. His door remained open and food and wine were available to Catholic and Protestant visitors who chose to enter. He became respected and served as a moderating influence between the Catholic King Henry III and the Protestant Henry of Navarre, who later became “Good King” Henry IV. But it is through his essays that Montaigne reaches into the present day – essays that might serve to inspire a moderate approach in what looks likely to become a difficult year on both sides of the Atlantic. As we enter 2017, it is a time for leadership to be combined with humanity, and politicians who take up this mantle might recognise they have an illustrious predecessor who now sits on a plinth in Paris and looks across the road to watch the students leaving the illustrious Sorbonne University. Students will cross to touch his foot, in a gesture that hopes to transfuse a fragment of his wisdom. Information on the location and times of the visits to the tower and chateau can be found on the Chateau Michel de Montaigne website. Acknowledgement to Mme Manon Grier for her help and hospitality in preparing this article. For further information on the life and works of Montaigne we recommend How To Live: A Life Of Montaigne by Sarah Bakewell.